Narcissism is the pursuit of gratification from vanity or egotistic admiration of one’s idealised self image and attributes. The term originated from Greek mythology, where the young Narcissus fell in love with his own image reflected in a pool of water. Narcissism is a concept in psychoanalytic theory, which was popularly introduced in Sigmund Freud‘s essay On Narcissism (1914). The American Psychiatric Associationhas listed the classification narcissistic personality disorder in its Diagnostic and Statistical Manual of Mental Disorders (DSM) since 1968, drawing on the historical concept of megalomania. Narcissism is also considered a social or cultural problem. It is a factor in trait theory used in various self-report inventories of personality such as the Millon Clinical Multiaxial Inventory. It is one of the three dark triadic personality traits (the others being psychopathy and Machiavellianism). Except in the sense of primary narcissism or healthy self-love, narcissism is usually considered a problem in a person’s or group’s relationships with self and others. Narcissism is not the same as egocentrism. The myth of Sisyphus tells about a man punished for his hubristicbelief that his cleverness surpassed that of Zeus himself. He has to push a stone up a mountain each day, only to have to recommence the task on the next day. 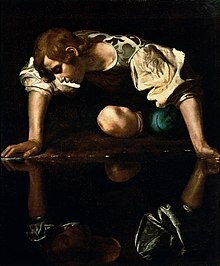 The term “narcissism” comes from the Greek myth about Narcissus (Greek: Νάρκισσος, Narkissos), a handsome Greek youth who, according to Ovid, rejected the desperate advances of the nymph Echo. This caused Narcissus to fall in love with his own reflection in a pool of water. Unable to consummate his love, Narcissus “lay gazing enraptured into the pool, hour after hour,” and finally changed into a flower that bears his name, the narcissus. [not in citation given] The concept of excessive selfishness has been recognized throughout history. In ancient Greece the concept was understood as hubris. It is only more recently that narcissism has been defined in psychological terms. In 1752 Jean-Jacques Rousseau‘s play Narcissus: or the Self-Admirer was performed in Paris. In 1899, Paul Näcke was the first person to use the term “narcissism” in a study of sexual perversions. Sigmund Freud published a paper on narcissism in 1914 called “On Narcissism: An Introduction”. In 1923, Martin Buber published an essay “Ich und Du” (I and You), in which he pointed out that our narcissism often leads us to relate to others as objects instead of as equals. These criteria have been criticized because they presume a knowledge of intention (for example, the phrase “pretending to be”). Behavior is observable, but intention is not. Thus classification requires assumptions which need to be tested before they can be asserted as fact, especially considering multiple explanations could be made as to why a person exhibits these behaviors. Shamelessness: Narcissists are often proudly and openly shameless; they are not bound by the needs and wishes of others. Narcissists hate shame[clarification needed], and consider it “toxic”, as shame implies they are not perfect and need to change. Narcissists prefer guilt over shame, as guilt allows them to dissociate their actions from themselves – it’s only their actions that are wrong, while they themselves remain perfect. Magical thinking: Narcissists see themselves as perfect, using distortion and illusion known as magical thinking. They also use projection to “dump” shame onto others. Arrogance: A narcissist who is feeling deflated may “reinflate” their sense of self-importance by diminishing, debasing, or degrading somebody else. Envy: A narcissist may secure a sense of superiority in the face of another person’s ability by using contempt to minimize the other person or their achievements. Exploitation: Can take many forms but always involves the exploitation of others without regard for their feelings or interests. Often the other person is in a subservient position where resistance would be difficult or even impossible. Sometimes the subservience is not so much real as assumed. This exploitation may result in many brief, short-lived relationships. Narcissistic personality disorder affects an estimated 1% of the general population. Although most individuals have some narcissistic traits, high levels of narcissism can manifest themselves in a pathological form as narcissistic personality disorder (NPD), whereby the individual overestimates his or her abilities and has an excessive need for admiration and affirmation. NPD was revised in the DSM-5. The general move towards a dimensional (personality trait-based) view of the Personality Disorders has been maintained. Some narcissists may have a limited or minimal capability to experience emotions. The Cochrane Collaboration has commissioned two reviews of the evidence for psychological and medical treatments for Narcissistic Personality Disorder (NPD). In both cases, they suspended their initiatives after the authors had made no progress in over a year. There are no clear treatment strategies for NPD, neither medication, nor Psychotherapy. There is evidence that therapies effective in the treatment of other personality disorders do not generalise to NPD. Psychiatric diagnoses are not formulated for stability over time. [clarification needed] Spontaneous recovery from mental ill-health does sometime occur and many comorbid conditions (e.g. anxiety) can be treated. Karen Horney saw the narcissistic personality as a temperament trait molded by a certain kind of early environment. She did not see narcissistic needs and tendencies as inherent in human nature. Craig Malkin called a lack of healthy narcissism “echoism” after the nymph Echo in the mythology of Narcissus. Healthy narcissism might exist in all individuals. Freud said that narcissism was an original state from which the individual develops the love object. [qualify evidence] He argued that healthy narcissism is an essential part of normal development. According to Freud, the love of the parents for their child and their attitude toward their child could be seen as a revival and reproduction of their own narcissism. The child has a megalomaniac omnipotence of thought; the parents stimulate that feeling because in their child they see the things that they have never reached themselves. Compared to neutral observers, parents tend to overvalue the qualities of their child. When parents act in an extreme opposite style and the child is rejected or inconsistently reinforced depending on the mood of the parent, the self-needs of the child are not met. Freud contrasted the natural development of active-egoistic and passive-altruistic tendencies in the individual with narcissism, in the former, and what Trevor Pederson referred to as echoism, in the latter. Where the egoist can give up love in narcissism, the altruist can give up on competition, or “the will,” in echoism. The individual first has a non-ambivalent relations of fusion with authority or love figures, which are characterized by the egoistic or altruistic drives. Second, the individual can move to defusion from authority or love figures which leads to repetitions of ambivalent, narcissistic or echoistic relations. In the third movement the individual becomes the dead or absent parental figure that never returned love to the echoist, or the perfect, grandiose parental figure in narcissism. While egoism and narcissism concern dynamics of power and inferiority/superiority, Pederson argues that altruism and echoism concern dynamics of belonging and inclusion/exclusion. Pederson has two types of echoists: the “subject altruist” and the “object altruist”, with the former being concerned with the belonging of others and loving them, and the latter being concerned with their own belonging and being loved. The subject altruist is self-effacing, a people pleaser, and sacrifices her desire to help others who are outsiders become insiders, or to be the submissive helper of an insider. The object altruist is gregarious, a people person, and wants to be interesting which is based on wanting to fit in and not be an outsider or wanting to be unique as an insider. Both types of echoists show issues with being submissive, having problems saying no, and avoiding conflict. I was a registered parishioner in an FSSP parish in Nashua, New Hampshire. The pastor said I can join even though I am housebound. He said that he will bring me the sacraments but he didn’t. He ignored me for over a year and after talking on the phone once and being ignored again I decided to leave his parish and try again elsewhere because the sacraments are important. The resulted in an email response from him finally but he was nasty. He called my email “passive aggressive” and accused me of making “unreasonable demands”. I was confused and upset and ashamed and I thought I must be a horrible person to illicit such a response from a priest but now I think he is a narcissist and definitely passive aggressive and I wish I never had that experience with him because I am still upset about the way he treated me almost a year later. In his last email to me he asked me to wait a little while longer. That was over 9 months ago and I finally received help from a deacon that took compassion on me and he visited me twice and he gave me one of his bibles to keep. I am thankful that I got to meet this nice deacon but I am still upset and I feel angry about the way that priest treated me. I know I need to put this in God’s hands and to let go of the anger and pray for that priest.